We are two longtime teachers in the Los Angeles Unified School District and native Angelinos who love to discover the hidden gems that exist in our favorite city. We set out to interview who we consider to be local heroes behind our favorite places and events, and bring you stories of those who contribute beauty, steward nature, share their culture and inspire us. As third grade teachers, for many years we have taken our students to the Will Geer Theatricum Botanicum in a wooded setting at the top of Topanga Canyon. There the kids learn the art of sword-fighting and Elizabethan stagecraft, and then are treated to a professionally staged Shakespearean production in an open-air theater. The happiness and enthusiasm on their young faces as they master a new skill and watch stage actors put it to use is what we live for as teachers. Luckily, everyone in Los Angeles can experience what we have witnessed year after year. The Theatricum was created in the early 1950s by actor Will Geer, who, when blacklisted during the McCarthy era, opened the theater on his Topanga property for other artists in the same predicament. Today, the Theatricum is a nonprofit that offers a full season of modern and classic repertory, summer camps, private coaching, internships and more. Q: Have you always lived on the theater grounds? Geer: Once upon a time, we were a very happy family living in a very fancy house, learning the art of consumption that was in full force beginning in the 1950s. Dad worked on Broadway but he studied botany and loved farming. He felt that gardening was as important as acting or parenting. We lived in luxury, with fancy schools and the first televisions and eventually followed his career to Los Angeles. Q: When did your fancy lifestyle take a turn? Geer: I was about 10 with a baby brother and older sister. One day, there was a knock-knock on the door and a man handed Mother a pink paper. Pop was hiding in a closet as the server handed the subpoena to mother for Dad to testify before the House Un-American Activities Committee. After he refused to testify, Father was blacklisted and couldn't work. My sister and I were treated badly as red-diaper babies (children whose parents were members of the United States Communist Party). Our friends weren't our friends anymore. They chased us and threw rocks. Q: What did your family do? Geer: Mother Kate (Will Geer's mother) found (the Topanga) land to help us heal, but Father couldn't heal. You can't take an actor's work away from him if he is a real man of the theater. Pop started to fade away. I could see a man being destroyed. At 10 years old, I couldn't understand it. Q: But eventually life went on, and presumably, so did all of you. Geer: We started Geer Gardens here. Dad planted every species mentioned in Shakespeare's plays. We sold plants and told people their Latin names. Every once in a while an actor would hire Dad to do some landscaping and we'd all pile in the car with our shovels. They could never pay him with a check that could be traced. Our parents protected us, and we tried to understand. Q: Your father was far from alone in being blacklisted. Did others join you? Geer: Yes (Folk singer) Pete Seeger lived on our grounds with (actress) Francis Farmer and others whose work had been taken. (Singer-songwriter) Woody Guthrie lived here until his Huntington's Disease became too advanced. Q: What did you learn during this trying time in your family's history? Geer: Those times made us strong and helped us learn to survive. If people don't like you, that's OK, keep doing what you do. That's what every young person needs to know. Being isolated from society felt like the worst thing that could have happened, but in retrospect it was the best thing. We learned independence and humanity and not to be bitter. Father was never bitter. 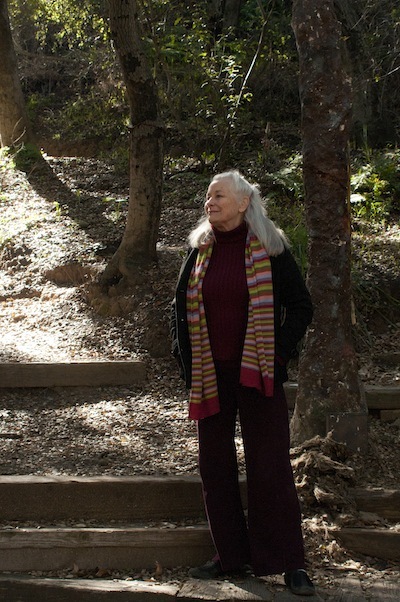 Q: How has the Theatricum evolved to become what it is today? Geer: When Dad founded Theatricum in the early 1950s for blacklisted actors to work, it literally fed our family, with chickens, goats, and a garden. By the 1970s, Pop was Grandpa-Walton (on the television series The Waltons) and suddenly we had a totally different experience in Hollywood. When Pop died in 1978, we had to decide what to do and how to raise funds to continue educating children about theater. And although Dad was never a communist, he always supported labor, and it was important to him that this theater pay equity wages to actors. Q: What makes the Theatricum unique? Geer: I love when kids to come to our grounds and see stink bugs and lizards and garter snakes, and get close to nature. That's why we work and stay here as a company and a family. Nothing takes the place of seeing live acting. You have to use your full imagination. Actors give to audiences like no other medium. At the Theatricum, our education department is part of who we are; our main actors teach and pass on what they know, and that makes for a better society. Art is the combination of human emotions and historical times.